I was first introduced to these containers at a reptile show. I purchased a Theraphosa stirmi and it came in a small breeding box. The first thing I noticed was the quality. The clear plastic of the enclosure seemed slightly thicker than those used on Critter Keepers. Next was the quality of the lid, which is what really sold me on the product. The plastic used on the lids is much more rigid than with the Critter Keepers and they are designed to be stacked. I don’t think this was ever really the intention of Critter Keepers. 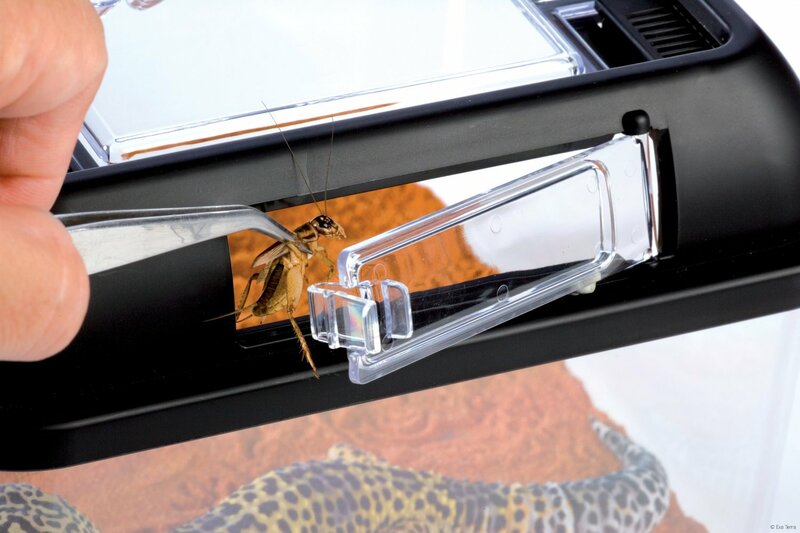 The lids afford the same kind of ventilation as the Critter Keepers but also feature small doors that you can use to introduce prey items. The small boxes feature one door but the medium and large ones feature two. The side doors work best when feeding your tarantulas while the boxes are stacked. 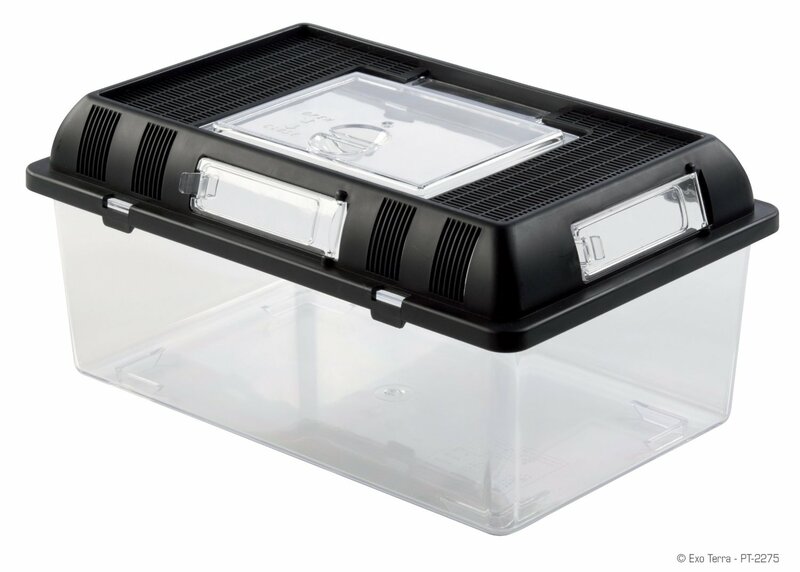 The top of the lid also features a large door for access to the inside of the enclosure. These are much larger than those on the Critter Keepers and I also find that they open a lot easier. The only real downside I see with these are their depth. I have found that most tarantulas are opportunistic and take advantage of their surroundings to make their homes. For species that are, the Breeding Boxes are perfect especially if you add a cork hollow or someplace for the tarantula to retreat to. If it is a species that burrows then a Critter Keeper may actually be better because they are much higher and you can fill it with much more substrate. 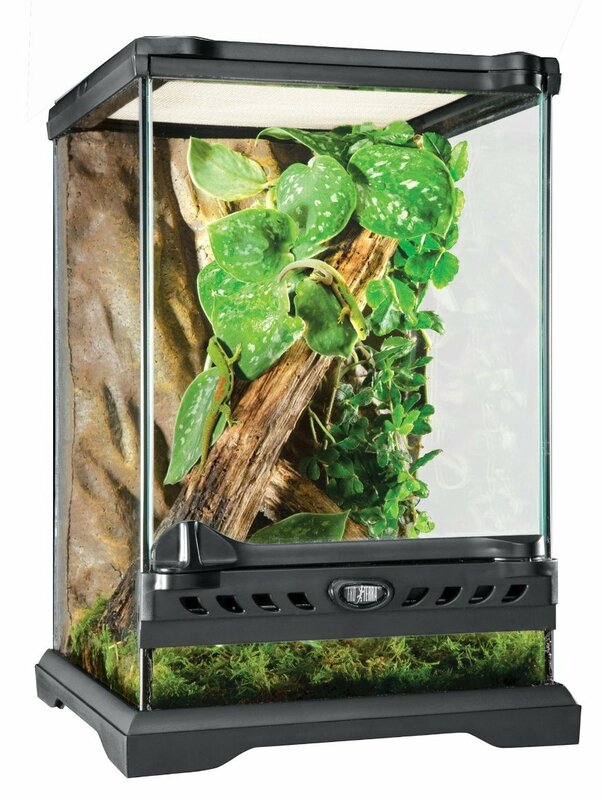 These boxes will not work for arboreal species but thankfully Exo-Terra makes up for it with their Nano Natural Terrariums. 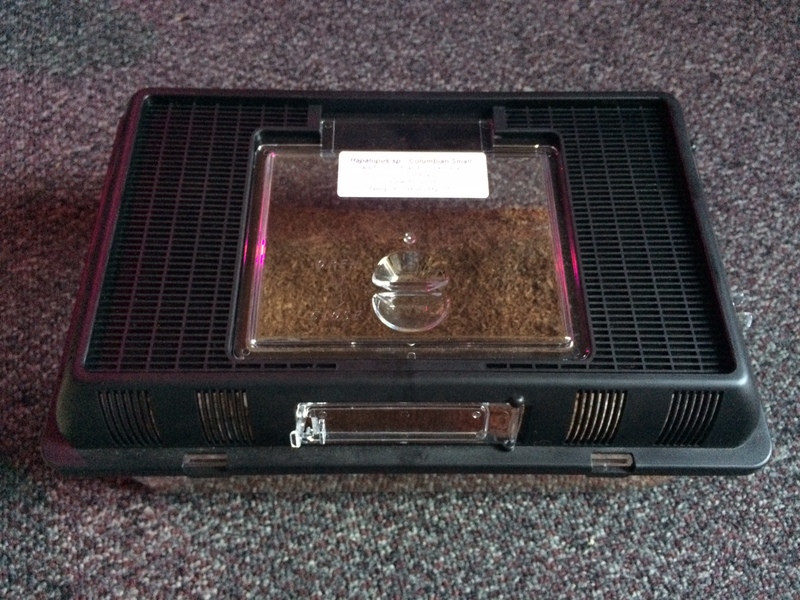 I have found that the three sizes of the Breeding Boxes work perfect for every size adult tarantula (spiderlings should not be housed in these as they can escape through the ventilation holes just like they can with Critter Keepers). Dwarf species can be housed in the small (8 inches long x 8 inches wide x 5.5 inches high) sized box, average sized species will fit nicely in the medium (11.8 inches long x 7.7 inches wide x 5.7 inches high) boxes and large tarantulas can fit in the large (16.3 inches long x 10.4 inches wide x 5.8 inches high) boxes. I would also recommend buying them off of Amazon, especially if you use Amazon Prime. The prices on these fluctuate almost daily so monitoring them is the best way to get the lowest prices. For example, as of this writing, I have seen the medium boxes go from anywhere from $13.00 to $16.00! 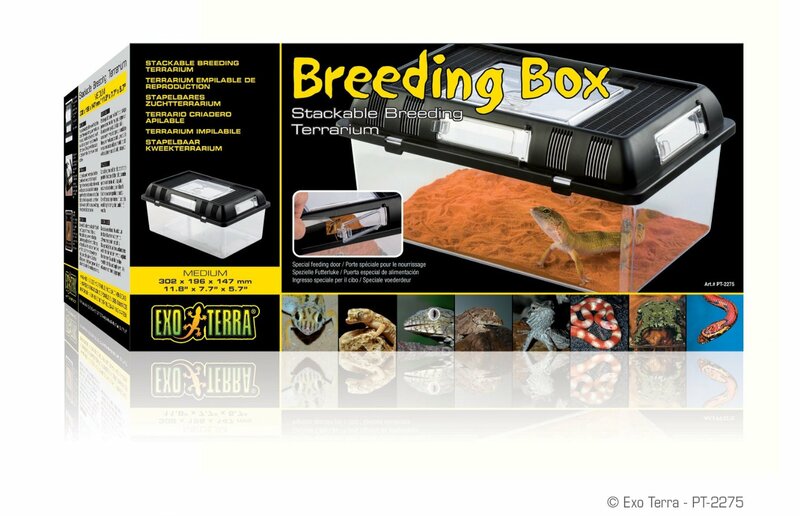 If you are like me and like to have a uniformed and organized animal collection, then I cannot recommend the Exo-Terra Breeding Boxes more. They make keeping and feeding so much easier and when you have a lot of animals, the easier it is to work with them the better! 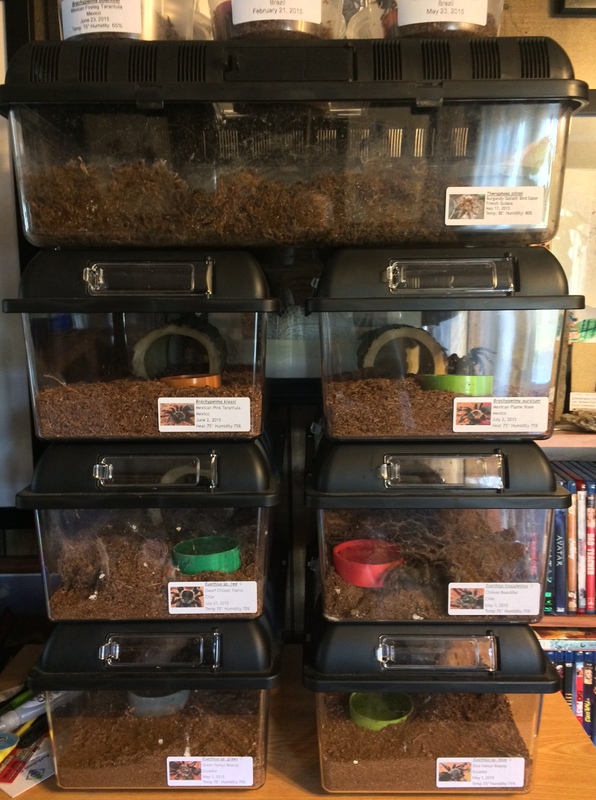 This entry was posted in Product review, Tarantulas and tagged Amazon, Amazon Prime, Breeding Boxes, Exo Terra, ExoTerra, Nano Natural Terrarium. Bookmark the permalink.